I-405 nightmares: Can they be fixed with $3 billion in toll lanes, interchanges, bus rapid transit? Interstate 405 on the Eastside serves 900,000 people a day, and parts of the freeway haven’t been expanded since 1984. That will change starting next year. Last month a new carpool formed in Renton, where young finance worker Winnie Chan hopped inside a black Mazda sedan, heading to Bellevue. That stretch of highway was last expanded in 1984, adding a carpool lane to the two general lanes each direction. Traffic in the curves has doubled to 180,000 daily trips since then. Commuters paid their 26.4 cents per gallon in gas-tax increases since 2003, only to watch the state build lanes and bridges in other cities. Renton’s morning drivers must budget a full hour to be sure of completing the 13-mile trip to Bellevue on time. Finally, the southern I-405 drivers will get their piece of the action. Next year, the state begins a $1.2 billion, 11-mile widening project, to be completed in 2024 — part of $3 billion in work planned or proposed for the freeway. But if commuters hope to drive faster, they’ll need to pay again — because most of the new highway space will be express toll lanes. The design adds one express toll lane and converts the free carpool lane to express tolls, alongside the existing two or three general lanes each way between Renton and Bellevue. Like the northern half of the freeway, the price to escape general-lane congestion will fluctuate between 75 cents and $10, rising when traffic thickens. Carpools of at least three people can travel free by swiping red on the state’s windshield-mounted Good to Go Flex Pass. General-lane drivers might also see some relief at two logjams. Southbound exit-only lanes will be added at Coal Creek Parkway and Kennydale Hill so exiting drivers don’t hinder the traffic continuing through. Roundabouts at both interchanges will replace conventional signals, and $75 million more will fund roundabouts at Totem Lake in north Kirkland. Meanwhile, Sound Transit will create an 11-stop bus-rapid transit (BRT) network from Lynnwood to Burien, spending roughly $1 billion for passenger stations, highway ramps, buses and park-and-ride garages. Lawmakers next year will consider whether to spend highway-toll windfalls to finance $710 million worth of bonds for even more lanes. 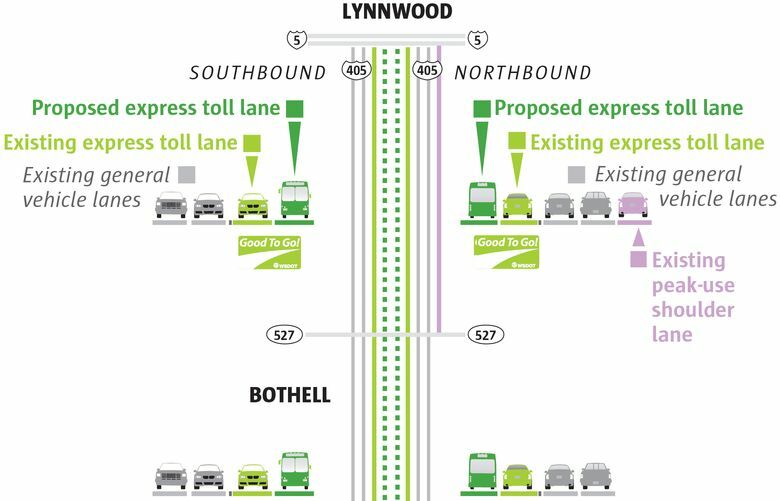 The project would build a second toll lane each direction from Bothell to Lynnwood, and a second Sammamish River bridge, to unclog the bottleneck there. 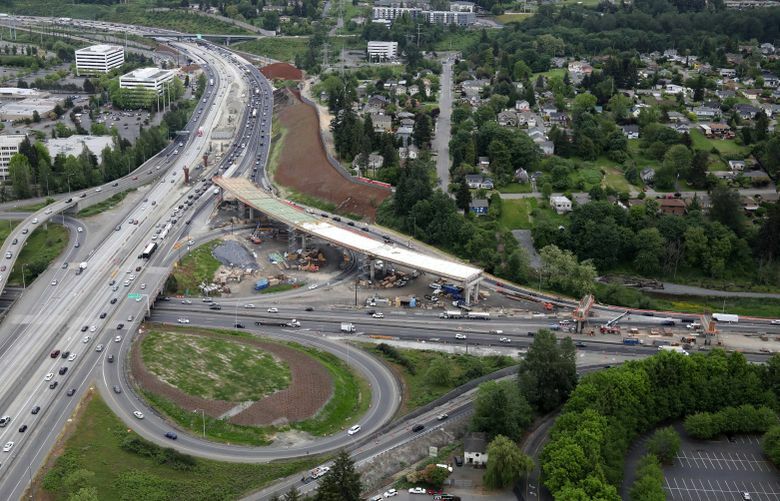 To the south, patches of toll and exit-only lanes would be paved on Highway 167 through Kent, Auburn and Puyallup. The highway and transit megaprojects are designed to work together. For instance, Sound Transit’s future I-405 bus station at Northeast 85th Street in Kirkland will also give drivers another place to reach the express toll lanes, by sharing a roundabout interchange with buses. And Sound Transit needs the state to ensure its toll lanes flow at 45 mph, both north and south of Bellevue. Otherwise buses will run late, and might fail to entice the targeted 18,000 daily riders. “We would not make this investment, anticipating BRT on I-405, if we did not have managed lanes,” Sound Transit CEO Peter Rogoff said. If successful, a bus commute from Lynnwood to Bellevue will take 42 minutes, compared with 50 to 57 minutes on today’s express-bus schedule. An estimated 912,000 people a day, in 760,000 vehicles, travel on the 37-mile I-405/Highway 518 corridor between Lynnwood and Burien, according to the Washington State Department of Transportation (WSDOT). Trips increased 17 percent through Kirkland from 2015 to 2017, nearly triple the statewide increase of 6 percent. Five years of heavy construction still won’t boost capacity fast enough to meet demand, says state Senate Transportation Committee Chairman Steve Hobbs, D-Lake Stevens. Hobbs said roads and transit should increase simultaneously, as a two-front “envelopment” to fight congestion. Bicyclists and pedestrians will gain as many as four new trail segments near I-405. Those include the timber Wilburton train trestle in Bellevue. a former railbed between Newcastle and Renton, and possible bridges over Northeast Eighth Street in Bellevue and Totem Lake streets in north Kirkland. Chan, 23, says she fled noise and high rents in Seattle’s University District this summer to share a roomy $1,500 apartment In Renton with her boyfriend after graduating from Seattle University. She works at Expedia in downtown Bellevue. Her carpool partner, Ruby Redd, of Kent, cruised onto I-405 at Sunset Avenue on a late-August morning and immediately swung the steering wheel toward the carpool lane. They passed two clumps of braking cars in the other two lanes and reached Bellevue in just 14 minutes — 20 minutes faster than normal, even in the fast lane. Redd says she began using the Scoop carpooling app this year to gain left-lane access and a $9 daily payment. She so hates stop-and-go driving, she’d rather detour to pick up a passenger and chat. As her typical hourlong commute ended at Microsoft, Redd noticed light-rail columns being installed off Highway 520. She assumed there would be a Kent-Bellevue train someday. Nope, these trains will go to Seattle’s Chinatown International District. Redd expects to still drive I-405 in five years, gladly paying a $6 toll or even the $10 max, or divide the toll costs in a two-person carpool. “The feeling you’re losing two hours a day stuck in traffic is infuriating. You could be doing something productive, playing with your kids, or even working,” she said, acknowledging some people can’t afford to pay. By the time new lanes open, Chan will be commuting with other partners in other congestion. Expedia is moving to Interbay next year, on the Seattle waterfront. The new toll lanes will frustrate many drivers, who already pay the nation’s third-highest gasoline tax at 67.8 cents per gallon. Of the total, 18.4 cents are federal and 49.4 cents are state tax. “That’s one of the points of the tolls. How many different ways can we take money out of people’s pockets?” said David Hablewitz, of Bothell, founder of Stop I-405 Tolls, at a Lynnwood forum. Dave Burger, a longtime Renton commuter who moved to Tacoma, said an additional one lane each direction would still fail to match dollars or capacity showered upon affluent communities in Bellevue and Mercer Island, or light rail promised to Issaquah. The southside I-405 users deserve the same three general lanes plus two toll lanes Kirkland got, he said. Renton may never see light rail. “We pay, we pay, we pay into this system and we don’t get anywhere close to what we pay into it,” he said. 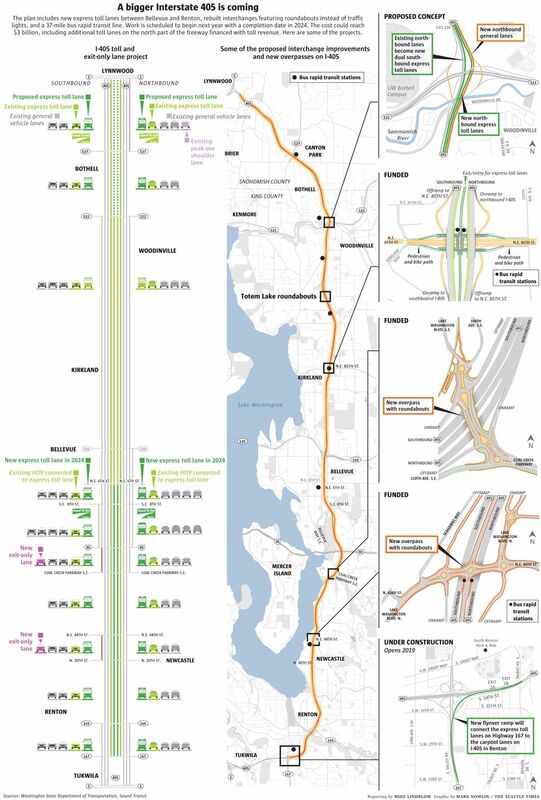 The pro-roads Eastside Transportation Association accuses the state of abandoning its I-405 master plan of 2002, which envisioned two more free lanes each way by 2020. But WSDOT’s Kim Henry, the corridor manager, points to plan language for “future consideration” of lane pricing — the path that lawmakers ultimately chose in 2011. Worldwide experience in cities such as Los Angeles shows that merely adding general lanes is futile, says Professor Mark Hallenbeck, director of the Washington State Transportation Center at the University of Washington. Express toll lanes flow better and encourage carpools, van pools and buses, he said, so move more people in the same amount of space. Another condition changed since the 2002 proposal to add general lanes. The Earth is 1.5 degrees hotter than last century’s average. Though minuscule on a global scale, Washington law says the state shall reduce overall greenhouse-gas emissions to 25 percent below 1990 levels by 2035. Carbon pollution hasn’t declined at the needed pace, official reports say. The I-405 project’s July environmental report predicts virtually no change in carbon dioxide from the coming highway additions, compared with a no-build scenario. Express toll lanes are intended to reduce exhaust from cars idling.